Single-Ply roofing membranes are a common roofing alternative to traditional substrates such as asphaltic and metal roofing. Single-Ply membranes are rubberized or plasticized membranes that got their original concept from a simple pond liner. If they could hold water inside a pond, then they should be able to hold water outside of a building. Single-Ply roofing today comes in a variety of different products including EPDM, PVC, Hypalon and TPO membranes. Many of these single-ply membranes offer cost savings over traditional roofing materials; however, they have experienced multiple reformulations of their products to try and achieve success. Single-Ply roofing is manufactured in multiple widths, but rarely do these widths accommodate a full roof. Much like an asphaltic membrane the single-ply membrane requires seams, which in this case, are heat welded. Over time or through poor workmanship these seams can fail and offer a perfect avenue for water infiltration. More short comings of these products can be excessive wear, brittleness, and chalking. National Coatings has a unique ability to address most of these difficulties when they become an issue for a building owner. 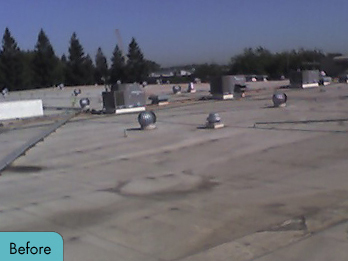 Most coatings require caustic primers, acid etching agents, or high VOC solvents that need to be rinsed off and sometimes collected for disposal, adding additional cost to a roof life extension project. National Coatings products have a unique ability to coat any single-ply roofing membrane without the need to use any of these harmful products. Our state of the art coating systems adhere directly to all single-ply substrates providing a monolithic membrane without any of the seams that can be prone to failure. Unlike single-ply membranes, coating restoration does not classify a new roofing system. 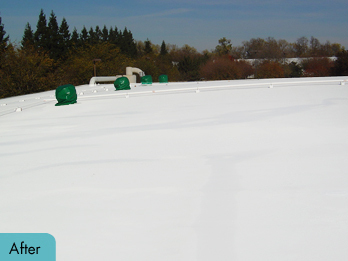 This eliminates the need for periodic tear-off of roofing membranes and gives a truly sustainable roofing system by re-coating every 10 years on a maintenance schedule. AcryShield A502, A500, A510, A550 and A590. Quickset products A600, A602 and A610.